Samsung is the top smartphone manufacturer in the World and to stay at the top, it has to bring out new models of its devices every year. The famous Galaxy Note Series is about to get another member as Samsung has sent out invites for an UNPACKED Event taking place on September 3rd, 2014. 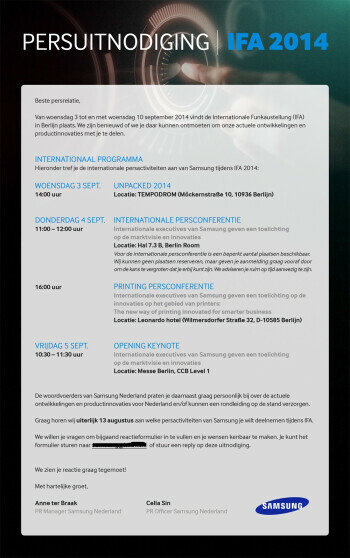 The major announcement of this event will be the Samsung Galaxy Note 4. This will be another iteration of the most popular phablet series by Samsung. The smartphone manufacturers are going to keep the tradition of unveiling the phablet at IFA just like it predecessors. Samsung Galaxy Note 4 is set to hit the market with overwhelming specs of 5.7" QHD Super AMOLED display, a Snapdragon 805 chipset or an Exynos 5 Octa (probably region-dependent), a 16MP camera and 3GB of RAM. There might a bunch of other announcements in this event as well including a Virtual Reality headset made by Samsung.